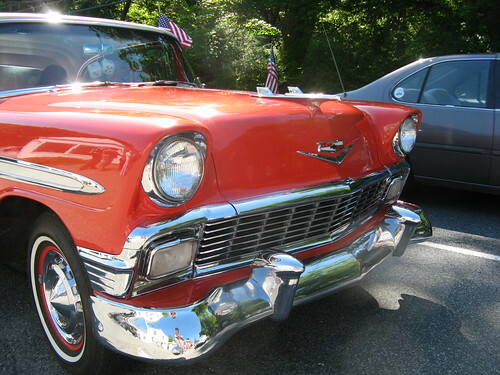 Vintage cars are a common sight around here in the summer - they gather at parades, at Lime Rock Race Track events, and just drive around for fun. When I was visiting Detroit a few weeks ago I saw even more - great old Bel Aires and the like everywhere I went. This fine specimen drove through Sharon during the Memorial Day parade. It's Theme Day in the City Daily Photo Blog community -- to see Bright Colors around the globe, click here to view thumbnails for all participants and to vote for the next theme, visit CityDailyPhoto.com. Such a bright red colour. Oh, boy! Great Theme Day post! Mine is up at Portland Oregon Daily Photo.